About two weeks ago I was listening to a worship song called “We Will Ride”. I had been singing it constantly for a few days when one afternoon I walked into my art room and looked at a background wash I had done the week before and behold a white horse was looking at me in the background of the painting. I could his eyes looking at me, his mane, the bridle and his ears. All I had to do was outline what I could see in the background (the white horse supernaturally appeared). Thank you Lord. I knew He was referring to Revelation 19. The white horse and its rider Jesus. We will ride with the armies of heaven, dressed in white. The bride riding alongside Jesus. We will ride. The righteousness of God. The fire in His eyes is his love for His bride. 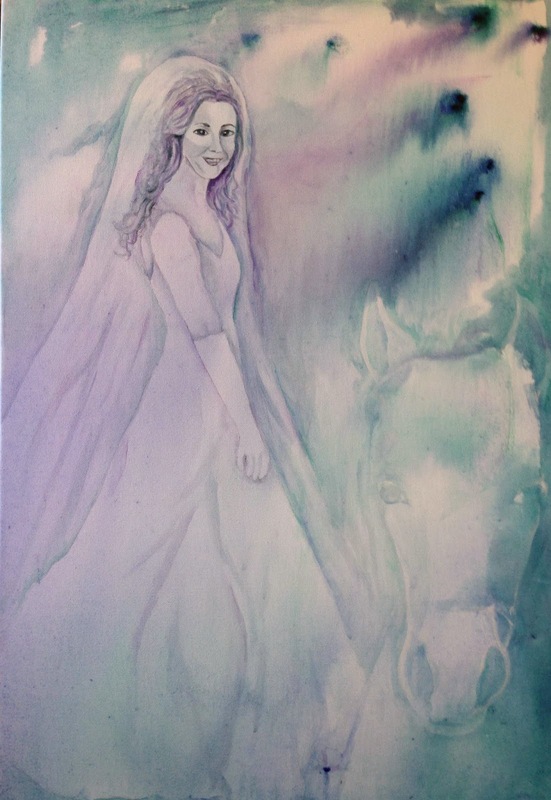 As I proceeded to outline the white horse, the veil of the bride appeared and the title came in “Beyond the Veil”. The presence of God manifest beyond the veil. Our righteousness in Christ grants us access to enter. An intimate relationship in prayer with Him, communing with Jesus is the key to transformation. Going higher, moving on up. It’s all about relationship. The Bridegroom desires an intimate relationship with His bride. The veil has been removed. This is the day. He has given us that new identity beyond the veil. He desires us to step into our new identity. “And he has made us kings and priests to His God and Father, to Him be glory and dominion forever and ever. Amen”. The painting revealed that “softness” which shows my love toward Jesus, which is symbolized by the colours purple, blue and jade. I saw these colours whilst worshipping at church prior to painting the bride. Like a gentle breeze, Jesus Christ’s Holy Spirit surrounds us and lives within all who are willing to receive Him. That gentle breeze is calm and refreshing, calling us deeper into our relationship with the Lord, so that His love can flow through us and infill us. Jesus is the substance of our faith. In 1 Kings19:12 The Holy Spirit came to Elijah through a still small voice. As I was painting this the Holy Spirit was blowing through me like a gentle breeze, quiet and silent, wrapping me in His love. He does not always come as a gentle breeze. Sometimes He manifests like a whirlwind as in Job. He spoke to Job out of the storm, giving direction and correction. He humbled Job and brought him to repentance. The Holy Spirit will never leave you. He is always there and it is so important to listen when He speaks. “And the Spirit of the Lord shall rest on him, the Spirit of wisdom and understanding, the Spirit of counsel and might, the Spirit of knowledge and of the fear of the Lord”. His gift of tongues to us is our weapon against the enemy. That wonder working power of Jesus’ blood protects us and gives us power over opposition from the enemy. We can be His warriors in times of war. It is only through Jesus. “but whenever a person turns to the Lord, the veil is taken away. Now the Lord is the Spirit, and where the Spirit of the Lord is, there is liberty. But we all, with unveiled face beholding as in a mirror the glory of the Lord, are being transformed into the same image from glory to glory, just as from the Lord, the Spirit”. PS If you look at an earlier blog in the year of a painting called "Zionward" you will see the colours are very similar. 2 Corinthians 3:16-18“but whenever a person turns to the Lord, the veil is taken away. Now the Lord is the Spirit, and where the Spirit of the Lord is, there is liberty. But we all, with unveiled face beholding as in a mirror the glory of the Lord, are being transformed into the same image from glory to glory, just as from the Lord, the Spirit”. PS If you go to a previous blog called "Zionward" you will see a painting with very similar colours to "Beyond the Veil". This painting is predominantly orange. The colour orange symbolizes the radiance of the burning Menorah. It is the colour of empowerment. Orange is the colour of fire. This reflects in the temple of our hearts. He desires that our hearts are burning for Him with passion. Prepared and constantly refilled with that Holy Anointing Oil, acting in love, in complete unity, purified and refined, filled by the Holy Spirit. There is only one way to become intimate with God and that is through Jesus Christ. Jesus is the bridge to everlasting life. He is our link to eternity. I Corinthians 3:11 “For no one can lay any foundation other than the one already laid, which is Jesus Christ”. 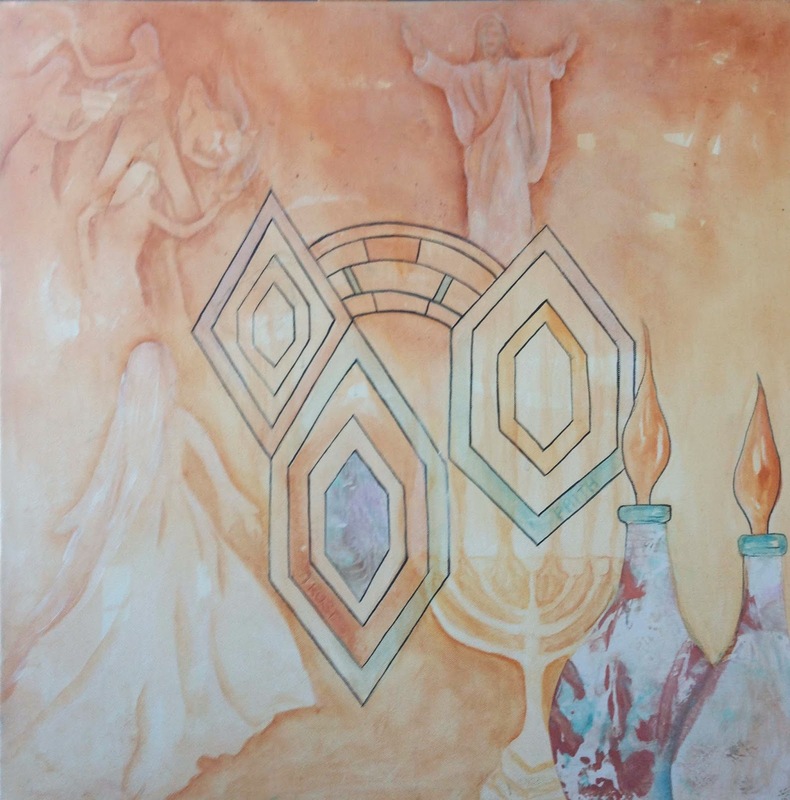 The three windows in the centre of the painting symbolize the open doorways. A window lets light through. The windows must be open in order for His light to shine through us. The more we are in Him the more His light shines through the windows of our heart. 1 Kings 7:4 speaks of the three windows in Solomon’s temple. They were artistic window frames. “Its windows were placed high in sets of three, facing each other”. Malachi 3:10 mentions about the windows of heaven. The bride and her bridesmaids are in this painting. The bridesmaids are holding the lighted oil lamps, welcoming in Jesus’ presence. The wise planned ahead of time, they had taken that extra container of oil that was necessary in the midnight hour for illumination. In order for those lamps to present light they had to endure the burning. (Matthew 25:1-13). He desires for His bride to burn for Him, arising and shining, opening the windows of our heart to let His light in, remaining in His presence, and moving on up to be one with Christ, that ultimate union. Arise, shine;For your light has come! "Let us be glad and rejoice and give Him glory, for the marriage of the Lamb has come, and His wife has made herself ready". 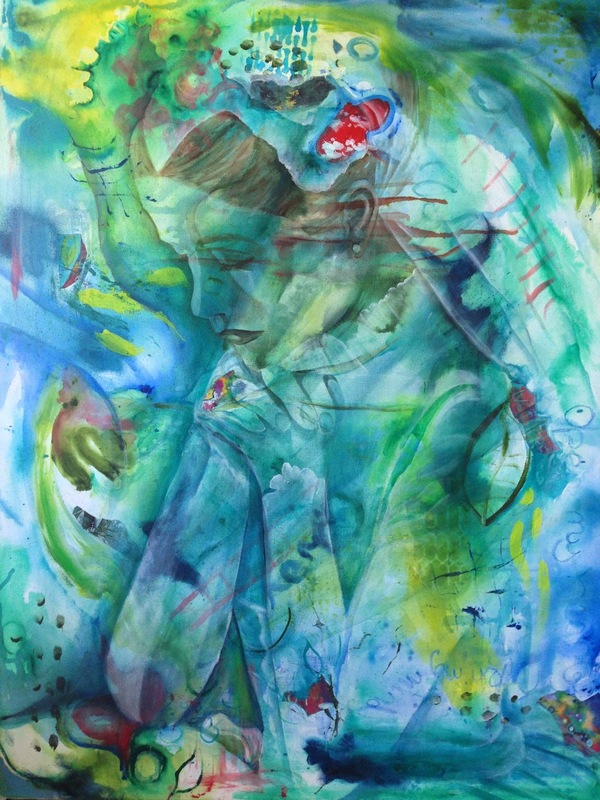 "The Bride Adorned - In a Posture of Prayer"
The words that were received while I was painting this were “deep calls unto deep”, “drowning in His presence”, “treasures of the sea”, “opening my heart and mind to love” , and “He is giving his Bride access to His heart”, that intimate connection. The Lord is coming for his spotless bride. He is advancing the bride into her destiny. The words I was led to write – opening my heart and opening my mind to love (these words were actually written in the background of the painting before I commenced painting the bride). The background of the painting speaks of the sea. The Lord is reaching out to humanity and he desires us also to reach out in brotherly love and affection, serving the Lord in diligence, rejoicing in hope, steadfast in prayer. Hope is joyful expectation. (Romans 12:10-12). The stream of joy flowing from within our hearts, enlarged with love from the Father. We shall be enlightened, our countenance shall shine. And of the treasures hidden in the sand"
– becoming more like Jesus, through prayer the deep things of God will be revealed to his faithful servants. The Spirit of God is reaching deep within the Spirit of His bride, through that sweet fellowship with Him in prayer. He so passionately desires us to be in that place with Him. A deeper dimension of His presence, that deep intimacy, waves of His peace flowing over us. The scripture in Psalm 45 speaks of the bride – It is the marriage song, the fire of His holy love. Thoughts of complete submission to Christ. It speaks of the royal Bridegroom, Christ and His glorious victories. It speaks of the Holy love between Christ and His bride. Psalm 45:8 speaks of the ingredients in the holy anointing oil, the oil of gladness. And in Psalm 45:15”With gladness and rejoicing they shall be brought; They shall enter the Kings Palace. “Then I, John, saw the holy city, New Jerusalem, coming down out of heaven from God, prepared as a bride adorned for her husband”. That heavenly city that John saw. Hear the voice of the bridegroom. Listen to His voice, join in the song of the Father. Adore him wholeheartedly. Worship and Praise Him. Meditate on His truth. In abandon submit yourself into the heart of the Bridegroom in a posture of prayer. He is awaiting.